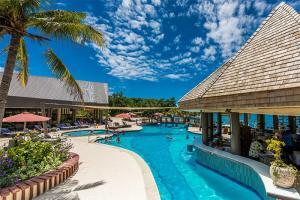 Mana Island Resort & Spa is a tropical paradise with beautiful clear water surrounded by white sand beaches. The hotel offers a choice of accommodations - executive beachfront bures, ocean view rooms and tropical garden bures. There are 3 main beaches, North and South Beach, and the famous Sunset Beach. Mana Island Resort is located in the Mamanuca Group of islands on 300 acres surrounded by beautiful white sandy beaches. It is 32 km from Nadi Airport and can be accessed by the Tiger IV Catamaran (90 minutes), seaplane or domestic flight (12 minutes). South Beach Restaurant, Mamanuca Restaurant, Lounge Bar, Pool Bar, BBQ Area. 2 fresh water pools, Water skiing, Scuba diving, Windsurfing, Spy-boards, Sailing, Canoes, Snorkelling, Tennis (day/night), Fijian cultural activities, Paraflying, Water scooter, Deep sea fishing, Banana boat, Jet ski, Nightly activities including Fijian Meke and dance shows.